So, you have a hiking trip planned with friends and family, and you need a tent to make the trip. However, there is one problem: you’re broke. Or at least, you don’t have the disposable income to get one of those high class, 3-figure price tag tents that you see in the department store. You need a tent that won’t cost you every cent you have left, so where can you get one? Just because a tent is under $100 doesn’t mean you have to forego quality in the tradeoff. You should still be able to get the same quality and protection you expect from other, more expensive tents from the cheaper variety. So, when you buy these tents, you have all the more to spend on supplies, food, and other essential hiking gear. So, if you’re about to head out on the camping trip of a lifetime with friends or family, here are the 10 best camping tents available under $100 that you can choose from. Note that none of these are bad, so if #1 doesn’t catch your eye as much as #9 does, you’re still guaranteed a quality tent. 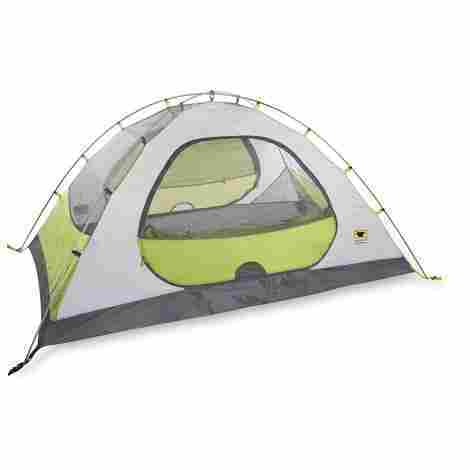 Starting off the list, we have the Coleman Sundome 2 Person Tent. This two-man tent from venerated camping company Coleman is a rather standard build for a tent, but the materials that comprise it make its value more than worth the price. The rainfly that’s included with the tent, when employed, makes an already water-resistant tent 33% more so, which is definitely an added bonus. Although this is strictly a 2-person tent, stepping in will demonstrate to you that there is more than enough room for those two people. Boating a footprint of 7X5 ft and a center 4 ft tall, this tent will make sure that you and whomever you have with you in this tent share more than enough space. One of the more impressive aspects of this tent is the fact that it takes the process of pole-clip assembly, one of the most tedious parts of the tent building process and makes it significantly faster. The Coleman Sundome is one of the most cost-effective entries on this list, which makes it cheap even by the standards of cheap tents. Kicking off #2 is the Kelty Salida 2. 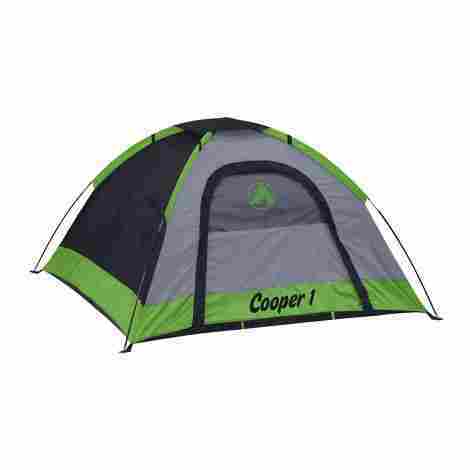 This is one of the most popular models of camping and backpacking tents of all time on the commercial market. This comes from the fact that this tent is not only fairly priced but also incredibly easy to use, which has made it very attractive to beginning hikers. It’s one thing to make one part of the setup process fast and easy, but the Kelty Salida makes the entire process fast and easy, which is much more preferable an option. You’ll be amazed at just how fast you manage to get this tent set up, both at home for the test run as well as out in the wild. Even with tents designed to fit into backpacks, the equipment can be cumbersome, and hard to carry around. However, the Kelty Salida is incredibly easy to work with and carry around, with particular mention going to the backpack-friendly compact folding poles. While the Kelty Salida will cost a little more than some of the other products you'll find on this list, the value more than makes up for it. Especially when you consider there are lesser tents out there on the market, worth twice the amount you’d have to pay for the Kelty Salida. Sporting a similar look to other tents such as the Rei passage line, with its rectangular shape, 2 doors, and crossing poles, the MountainSmith Morrison manages all of that at around half the price. This polyester tent will last you twice as long as the more expensive brands, at less than half the price. This may not seem like much to get excited about, but when you’re carrying a big load of metal cloth and polyester up a mountain, you’ll take as light a load as you can get, and the MountainSmith Morrison 2 is one of the lightest on the market. While the MountainSmith Morrison does lack some interior livability due to its lack of a top bar, which would otherwise make the walls more vertical, it does have the benefit of being designed with much roomier dimensions. This means that though the wall space is a bit cramped, there’s more than enough floor space, which accounts for a lot more. The cost of the MountainSmith Morrison won’t put too much of a dent in your bank account, but it definitely isn't the cheapest option on this list (far from it actually). But when you consider that you're getting more interior space for a lighter product, that may sway you to spend a little extra cash. At first glance, the Eureka Spitfire 2 may not seem like the ideal camping tent. It looks downright cramped. 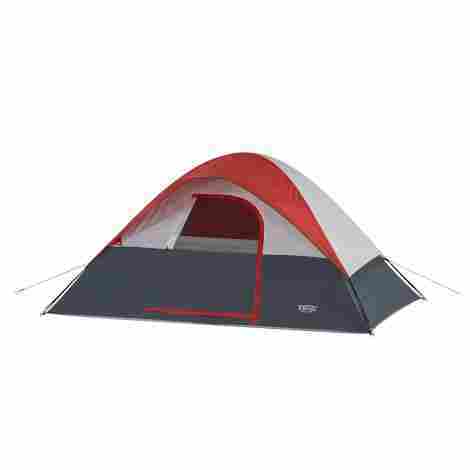 However, make no mistake, this tent is top of the line if you’re looking for cheap camping tents. Weighing in at 67 oz. of trail weight, this tent may be a bit on the hefty side, but it has a lot to offer. One problem that a lot of people have with camping tents is that they can be a little too insulated. And during sweltering summer months, that can be a problem. Luckily, the Eureka Spitfire has mesh panels that take up its walls, keeping bugs and animals out, while letting cool breezes from the outside in. One of the many annoyances of using tents is that most tents only have one door that the inhabitants have to share. This, as you can imagine, can get pretty annoying. So, it’s always good to find a tent with two, U-shaped doors, which both inhabitants can use to leave the tent without tripping over each other safely. The main problem with this model is the price, often rising above what we could consider to be 'cheap' for this top ten list. While you may find a lower price occasionally, for the most part, you’re stuck with a pretty high price tag for this one. 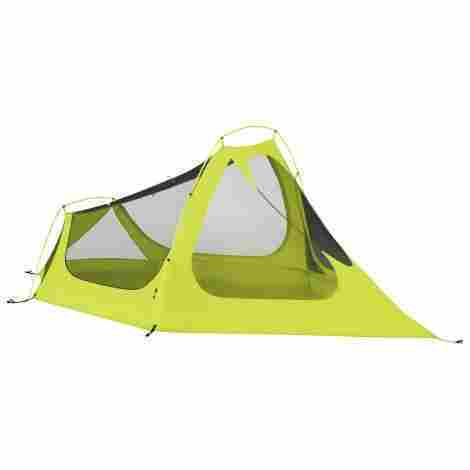 The ALPS Mountaineering Lynx 2 is one of the most popular models of budget tents on the market today. With its sleek design, ease of setup, and a reasonable price range for the services provided, this type of tent is not only of low price but also of high quality. Although again, there is no crossbar for this tent, there is still more than enough space, since the tent sports a 90 x 60 x 46 in. dimensions, which makes it ideal for 2, or even 3 people to sleep and move around in. While there are other ALPS products like the Chaos that have a crossbar, they’re actually much smaller in dimensions than the lynx, and thus much smaller. One thing you’ll find with the Lynx is just how much storage space there is. There’s a total of 8 zippers, which lead to storage pockets, stake compartments, gear lofts, two doorways, and guy ropes. While this may add to the bulkiness of the tent, this makes the Lynx one of the most versatile tents on the market. This is the most expensive option on our top ten list but you can expect to pay a little bit more for a higher quality product. But what if you’re not just taking one other person with you on this hypothetical camping trip? What if you’re turning this into a five-man band hiking adventure? Surely there must be a cheap tent out there that can handle five people at once. Well, you’re in luck because we have the Wenzel 5 Person Dome Tent. The Wenzel has some of the best waterproofing a tent of its kind can ask for. Built with 600mm waterproofing with a dash of seam tape on top to give it that extra bit of protection. While the materials used to waterproof the top of the tent do not extend to the bottom, the bottom has enough waterproofing materials built in to make up the difference. Brought along a generator, but don’t want to bring in the electrical cord into the tent because you don’t want to leave a small hole in the tent door for it? Well, worry not, for this tent comes with a special “E-port” a small port in the tent that lets you bring in your electrical cord without breaching the sanctity of your tent. This is one of the more "expensive" options on our top ten list but it's still a relatively inexpensive tent with a lot to offer campers on a budget! Need a cheap but quality camping tent for your kids? Can’t do much better than the Gigatent Cooper Camping Tent. Officially endorsed by the boy scouts, and with a price tag of less than $30, this tent is the perfect quality, affordable tent for your kids on their first hiking trip. When your kids are likely the ones who are going to be setting this up, it pays to have setup be as simple as possible for them. And it doesn’t get much easier than the Cooper. Which is very important when the inhabitants of this tent are young children. Kids are loud, wild, and uncontrollable, especially when pumped full of sugar and bouncing off the walls. So for their first camping trip with the scout troop, you need to make sure that the tent you send them off with can stand up against any roughhousing that will inevitably take place within its walls. 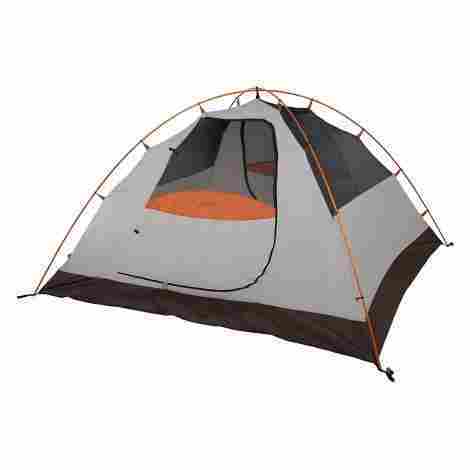 This is easily one of the lowest prices for a full 2-person tent on the market. But make no mistake, the quality of the tent is in no way sacrificed by that low-price tag. The main advantage of a dome tent is that you get the space that a triangular tent simply cannot provide without having to sacrifice weatherproofing, as the dome shape is just as effective at preventing water from building up on top of the tent. And nowhere is that more personified than with the CCTRO 2 Person Camping Tent. Got a good starry night out, but there are bugs everywhere outside that are preventing you from going out and properly enjoying it? The CCTRO comes equipped with a special mesh roof that lets you enjoy the beautiful starry sky in peace and quiet. One thing that annoys anyone who goes out camping is the feeling they get when the zipper on their tent breaks. Because that’s your only zipper, no second chances, and if there are bears in the area, then you’re in for a very restless night. Not something you have to worry about when you get the CCTRO, whose fabrics and zippers are made of sturdier stuff and will stand up to much more scrutiny than other tents. 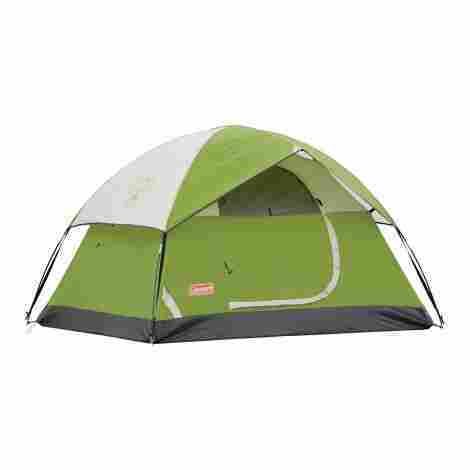 At a pretty average cost for our top ten list, this tent will fetch you a nice price for a very high-quality tent. Especially if you’re the stargazing type. 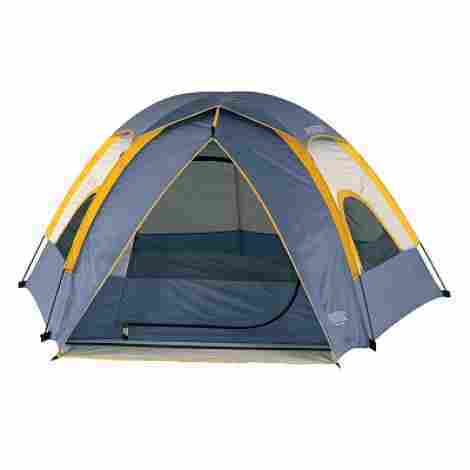 This polyester three person tent is incredibly spacious and will easily fit two people and one small child. The Wenzel Alpine is one of the best companions you can ask for in pretty much any weather condition you may find yourself in, and that’s not all this tent can do for you. Polyester is already one of the most durable fabrics available on the mainstream market, but the polyester blend used to make this product is one of the most durable among its peers. This option is perfect for the impatient person who can't be bothered with endless tent poles and pegs. The Wenzel Alpine is one of the fastest tents to set up thanks to its shocked-corded fiberglass frame. With a setup time that spans mere minutes, this tent will be up and ready before the campfire is even lit. 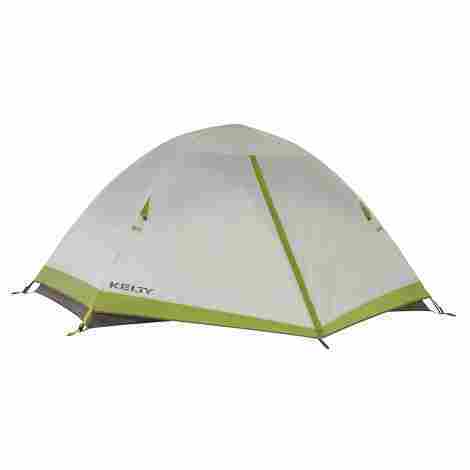 The Wenzel Alpine is one of the cheaper options on our cheap tents top ten list. It won't set you back much and its 8 by 8.5 feet size is big enough to fit three people rather comfortably. Maybe you’re not interested in all these frills, doo-dads, and special add-ons that these other tents have. Maybe you just want a no-nonsense, plain old tent that will get the job done. Well if that’s what you’re looking for, then the Techcell 2 Person Tent is right up your alley. 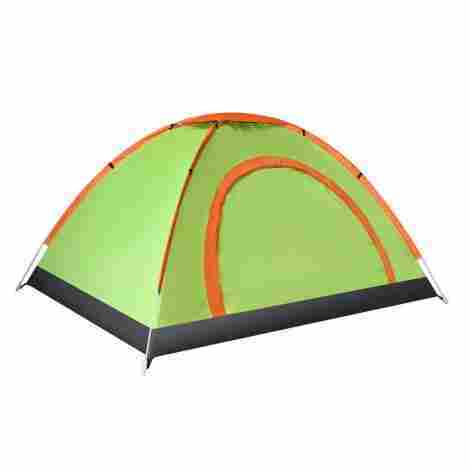 For as little as this cost you, you may be shocked to find that this tent is very resistant to strong wind and rain. It won’t hold up in a tsunami, of course, but during a particularly heavy rainstorm, you’d be surprised how much this little tent can take. What this means is that the exterior door can be unzipped, allowing it to be used to extend the footprint of the tent whenever the occupants are exiting or entering. The cost of this tent isn’t much. Rather average for this list but considering you’ll more often than not find this item priced around the low end of that spectrum, it’s a pretty good deal. When people think of cheap tents, they usually think of those really bad tents that are dead set on falling apart on you at a moment’s notice or worse, when you least want your tent to fall apart on you, like, say, during an intense rainstorm. However, just because something is affordable, or even downright cheap, doesn’t automatically make it bad. In fact, many of these tents have more to offer the average hiker and will give them far more in terms of service than the most expensive camping tents out there. Whether it’s better durability, more space to move around in, or just holding up against the elements better. You shouldn’t have to pay out the nose just to have a place to sleep out in the wild. Cheap tents have a lot to offer. They offer better services, more effective fulfillment of their purpose, and overall better experiences than that which you find in the leading brands of camping tents. So, if you need a camping tent, but money doesn’t grow on your tree, but you still want to give yourself and your family/friend group the single best vacation possible, by giving them the best place to sleep possible, try out one of these 10 cheap tents. They won’t disappoint you. This should be fairly obvious. When you have a list specifically looking for something of a certain price range, it stands to reason that you would want each entry to land within that specific range. You generally should not have to spend a small fortune just to have a good camping tent for a hiking trip. Generally speaking, you should always look for camping tents below $200, but if you can, try to shoot for below $100 because you may as well see just how low you can go with this. The odd ounce here and there may not seem like something to get worked up over. 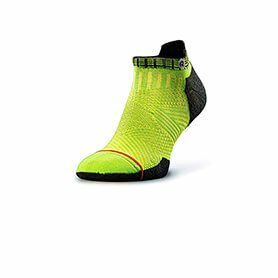 But rest assured, those few ounces are going to feel much different when you’re climbing up a hiking trail with those extra few ounces weighing down your back. In order to enjoy any kind of backpacking or hiking trip, you need to conserve as much weight as humanly possible, making sure that you are down to the bare minimum weight before you head out. Otherwise, you are in for a very sore back. Make sure to look at the weight rating of the tent you’re buying, then run it against the amount of weight that you know you can handle (one trip to the gym is the fastest way to judge this) and then use that to decide if that is the right kind of tent for you. First and foremost above all else should be the tent’s ability to withstand the force of the elements, but there are some steps you need to take beforehand. For one, you need to check and see what kind of weather patterns are most common in the area you’re going to be camping in. Next, you need to check for wildlife, what animals or bugs or whatever else are you in for when you go there? This is why you are looking for a budget tent, but not what’s referred to as an “extreme budget tent.” Because those tents will last five minutes at most against a hungry wolf or a harsh rainstorm. Find yourself a tent that is the right balance between affordable, and functional. This isn’t just referring to interior space, though that is important as well. This also refers to the storage space within the tent. Now, this doesn’t mean you have to have closet space within your tent, but a place to put spare stakes, somewhere to store the rope etc. goes a long way to make your trip all the more convenient, since not only is all the tent equipment specifically in one place, but so are all the necessary tools needed to set it up. Generally speaking, you should make sure you have at least enough interior space to move around and sit up straight. Standing, in a tent, should be considered optional, since people mainly sleep in their tents anyway. Just keep in mind, prioritizing interior space is prioritizing it over things like comfort and weight. So, if you prefer packing light in general and focus on simply going as many miles as you possibly can, then you should just stick to a small tent focused only around sleeping. If you’re a dedicated adventurer who flies solo, then a 1-person tent will do you just fine. The most popular capacity, however, is 2-person tents, because they generally have a better grasp on the balance between interior space within the tent and the weight of the said tent. The main downside, of course, is that the interior of the tent isn’t exactly deluxe treatment. Then there’s the 3-person tents, which have a nasty tendency to become overcrowded and impractical. However, if you have 2-3 hikers, this can be a really good fit if you can only afford to bring along one tent. And especially if you have a lot of gear and need space to store it away from the sleeping bags. This refers to how many seasons you can afford to camp in that particular tent. This is very important for any tent, to the point of simply having it was enough to bump up to #9 to its current spot on the map. 3 season ratings are the most popular of the bunch, since they’re built for summer, spring, and fall trips, and can handle any of the weather conditions that are natural to those climates. They can also generally take a little snow, but never a whole bunch, so you should find one specifically suited for snow if you’re expecting it on your trip. Even the tiniest single design flaw can ruin the entire structure of a tent. Tents are shockingly delicate structures, being cloth supported by metal sticks expected to stand up to extreme weather conditions and the natural elements. Thus, the design has to be perfect, from top to bottom, in order to properly do their jobs of protecting you from the elements just outside its ultra-thin cloth walls. Because of this, it’s imperative that tent designs remain as simple as can be, including multiple entry and exit points, plenty of headroom for the occupants in case they need to move around fast at a moment’s notice, air vents in order to bring down condensation, vestibule space, and finally interior pockets wherein you can store gear and spare clothes. Obviously, you want to make sure that the thing that you are trusting to protect you from the outside elements will stand up to physical scrutiny. When judging this, you have two options for routes. You can either have ultralight tents that are easier to carry around and set up but fall like a house of cards in a blizzard the minute so much as a stiff breeze comes into contact with it. Or you can have bulky, powerful mini shelters that are the most cumbersome, heaviest things to carry on a hike, but will beat off anything that tries to bring it down. Pick whichever one sounds like the best one for you and then find the best one within that category for you. Q: How can I find out the weight, season rating, etc. of the tent I’m looking at? A: it shouldn’t be hard. Whether you’re looking to buy it in a physical store or trying to buy online, it should very clearly display both of those things plus whatever else you may be looking for. This is important information that any serious hiker or camper needs to know in order to properly decide what tent to use, and the company behind these tents are aware of this. As such it shouldn’t be all that hard to find. Q: Is it a good idea to bring a tent that’s one capacity level above how many people I’ll actually be bringing along? A: If you have a ton of equipment in tow, then yes, that can be a great idea! The fact is, with a lot of hiking expeditions, especially if you’re hiking somewhere for a job, you’re going to be bringing along a lot of equipment, not to mention the rations and supplies you’d already be bringing along regardless of your reasons. So, if you have a lot of stuff in tow, then buying a tent that ranks one capacity higher than what you’ll be bringing along will give you a lot more space to work with. Or if you’re just heading out with friends for a weekend of fun camping out, then having that extra space will give you and your buddies room to play games. Q: How durable should my tent be? A: Durable enough to handle whatever you’re up against during that camping trip. If, for instance, you’re going camping up in a mountain that gets a lot of snow, then you’re going to need a tent that can hold up to the winter cold. 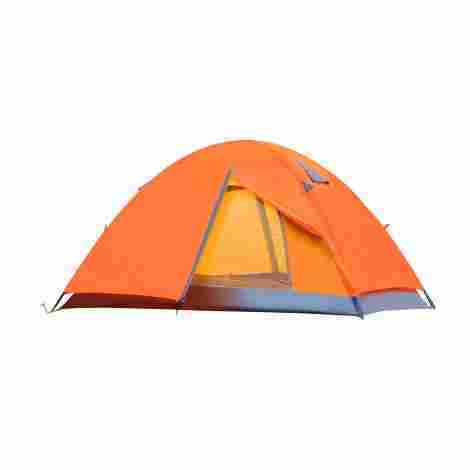 Or if you’re going camping in the summer, then your best bet is a tent that is very ventilated and thin, so you can keep yourself cool when the sun is high in the sky. The thickness of your tent should entirely depend on the conditions you expect to face. Q: How many doors do I really need? A: Just one if it’s just going to be you. However, when you bring along even one extra person, then you need to make sure the tent has two doors. Have you ever seen two people try to leave a tent with only one door before? It’s pretty funny, though only because you were likely not one of the participants. Trying to share a tent door is like two mice trying to share a mousehole, it’s awkward, cramped, and all involved are constantly tripping over each other. So, if you’d rather that not be you, just get a tent with two doors. Q: Why should I get a tent with multiple compartments for my supplies? A: Because if you don’t have enough room inside the tent or in your bags for all the rope, stakes, hooks, etc. that go into setting up a tent, having a little drawer here and there where you can put all of your equipment will seem like a godsend. This isn’t as much of a requirement, per say, but when you need it, you’ll be very happy that you have it. Q: Why does the price of the tent really matter? A: Because tents can be very, very expensive when they want to be. Some tents, which only offer services barely above comparison to the ones on this list, mind you, can cost 3x as much as the most expensive entries in this list. There is no shame in settling for a cheaper option under those circumstances. Those tents will try to make it seem like you absolutely need their option for a higher price, but do not be fooled. If you look hard enough, you’ll find a tent that is not only affordable but also just as good.